In a demonstration of this new interactive feature, Google shared this presentation given by Shree (Bose, first ever Google Science Fair top prize winner) to 200 middle school students. Students were able to ask their questions live as Shree was presenting and even those shy students who would not normally share their voice publicly were able to take part in the discussion. 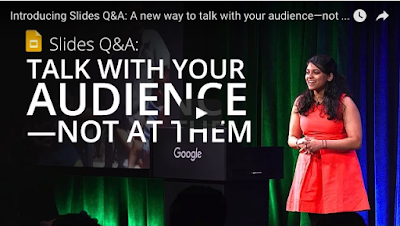 Watch the video to learn more about Slides Q&A.